If you are planning your holiday in Malaysia, one state to visit is the state of Melaka. Melaka promises an exciting array of tourist destinations and never miss to provide tourists sweet memory! If you are in Melaka and are looking for a great place to spend the evening, then head on down and be a part of the Melaka River Cruise. The Melaka River waterfront has been transformed from what it was in the 16th century to what it is today for the benefit of tourism in Melaka. The waterfront is dotted with beautiful and very old bridges, clan houses, churches and villages that still stand magnificent till this day. There are even gardens, fountains and performances here at the waterfront and is a great place to just enjoy an evening; relaxing as you watch the sights around you. The water is quite clear when the weather is fine, river cruises can be seen up and down the river waterfront. If you are up to the idea of traversing the river, begin your journey at the ticketing booth near the Quayside Heritage Centre. The River Cruise is opened every day from nine in the morning to five in the evening with an hour interval. The service commences again at six all the way down to midnight. You will then hop on board one of the many beautifully decorated boats which are aptly named after some of the local heroic figures. The boat ride is an amazing one and as you ride along, traditional music will be played giving the ride a more traditional charm to it. 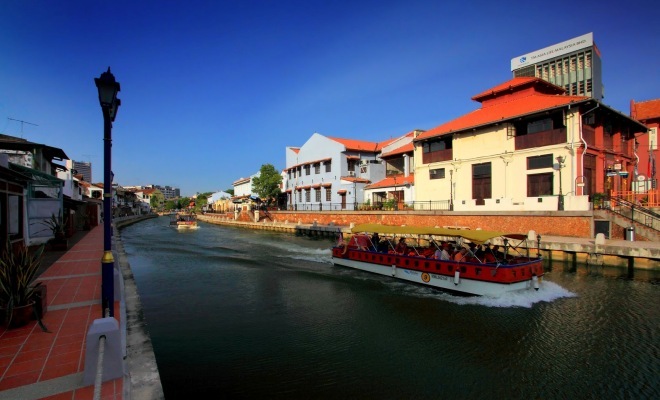 As you make your way down the Melaka River, you can see the many historical sightings on the waterfront. Look out for the Melaka tree which is where the state got its name from. On your journey down the river, you can also see some Malay houses by the water front with its traditional staircase in the centre. You should also keep an eye out for the replica of a pirate ship; the cruise boat goes quite close to this and is a good photo opportunity. Also along the river is the abandoned cinema and an old express bus terminal. The highlight of the tour is the many bridges that were built centuries ago. These bridges hold secrets and stories about the Portuguese settlements and their attempts to take over Melaka. The best time to come for a cruise down Melaka River is at night. This is when the lights make a spectacular and romantic cruise as you pass under the beautiful lighted bridges.